I was pedaling up a hill on a rented mountain bike, sweat evaporating under the fiery sun, glorying in the lunar-like scenery and cursing myself for not bringing enough water. I pedaled towards the Garden of the Gods, a surreal landscape of rocks, twisted lava and spires of stone, whose earth colors burst into passionate golds and reds at sunrise and sundown. The journey was rougher than I expected, and I was almost alone on the 12 kilometer dirt track that winds through the abandoned pineapple fields. As I neared the ridge, with its fine view of the Pacific Ocean, I sensed, then saw, a companion. It was a small brown and white Hawaiian short-eared owl, a pueo, which flew alongside for 20 minutes or so. Here on the sleepy, half-Singapore-sized island of Lanai, so distant in both attitude and lifestyle from the relative sophistication of Honolulu, nature’s emissaries carry many meanings, and I wondered what the yellow-eyed owl was telling me. Omens, superstitions, talismans, magic. And religion. People put their faith in all sorts of rituals, trinkets, spells, incantations, often through intermediaries — wise men and women who often wear peculiar outfits and claim a hot line to the spirits. Golfers are certainly not immune to such beliefs. People have complicated relationships with owls, perhaps more than with any other bird. Owls, like snakes, are generally good guys in the ecological sense. Owls eat mice and rats which eat farmer’s grain — one family of hungry barn owls can consume more than 3,000 rodents in a nesting season. But they have a mixed image in the spiritual context. In parts of Europe owls are associated with insight and good judgment, a belief that can be traced to Ancient Greece where Athena, Athen’s goddess of wisdom, had the owl as her symbol. But in other parts of Europe, as in much of the rest of the world, owls are associated with death. The Romans considered owls funerary birds. In Malaysia and Singapore they are called burung hantu, or ghost birds. The owl symbolized death and destruction among the Aztec and Maya; an old Mexican aphorism says “When the owl sings, the Indian dies”. Tiger Woods has his own omens and beliefs. You don’t need a fortune teller to know what he wears during the final round of every tournament he plays – his good-luck red shirt. Superstitious? Of course. It comes with the territory when playing golf in Asia. Shortly after I arrived in Asia I was invited to play at the Singapore Island Country Club. My friend Guy, a Straits-born Chinese, looked at the key I was given and asked the attendant for a different locker, explaining “Because you’re a foreigner he gave you a locker with the number ‘four’.” Guy complained and I was given a locker with an “eight”. “Eight” is good, I since learned, because the number pronounced in Cantonese sounds like the homonym for “prosperity”. And “four”? Fuggedaboutit . It sounds like shi in Cantonese, “death”. During my exhausting and exhilarating bike ride with the mystical Hawaiian owl I got off my bike, sat against a rock and watched the whales breach in the water far below. I was content, and lucky. I was playing Lanai’s two world class golf courses – the Greg Norman-designed Experience at Koele and the Jack Nicklaus-designed Challenge at Manele. I was a guest at two of America’s finest hotels. Was this just dumb luck that I arrived at this stage of life, this location on the planet, this degree of health? Of course I wasn’t totally naïve. The logic was simple — I was writing an article for a golf magazine (one which lets its writers accept freebies) and the resorts wanted the publicity. But maybe there was something more supernatural at work. Maybe I did something particularly good in a previous life. I only wish I knew what it was so that I could replicate the good deeds now in order to benefit my next time around. Maybe the owl’s wisdom comes from seeing the unseeing, hearing the unheard, its ability to stalk prey in the black of night, a time when people should be in their beds while spirits roam free. Was the owl a messenger from beyond? Superstition inhabits that shadow world that includes luck and ritual, and seems to play an important role in golf. “Golf, perhaps more than any other sport, relies on luck because of the natural environment in which it is played” suggests Steve Cohen, president of the California-based Shivas Irons Society, which promotes the “transformational” elements of golf. Cohen, who is a gestalt practitioner and workshop leader at the Esalen Institute in Big Sur, California, adds that everyone, not just golfers, needs superstitions because there is so much in the world that is not understandable. For the big “un-understandable” many people turn to formal religion. There is a fuzzy continuum between the power-infused sacred paraphernalia of formal religions — a crucifix or a St. Christopher’s medal for Catholics, or a Star of David or mezuzah for Jews — and the charms, talismans, rituals — a rabbit’s foot, a lucky coin, not stepping on a crack — that might be considered secular. Is there really so much difference between Tiger Woods wearing a sai-sin Buddhist cord bracelet offered by a monk and Rickie Fowler marking his Pro V1x with “4.13” referring to his favorite passage from Philippians “I can do everything through him who gives me strength.” All part of the same rainbow continuum. Folks might believe in a Hairy Thunderer or a Cosmic Muffin, the Earth Spirit or a Good Luck Goblin. They’re all ways to seek higher intervention in order to avoid problems and bring luck. In Bangkok, where I live, folks often deal with the inexplicable by acquiring amulets. The city, indeed the whole country, is rife with vendors proffering the triple-whammy of prosperity, protection and salvation. I went to one of my favorite locations, near the Saphan Kwai Skytrain station, where each weekend several hundred men and women sit at little kindergarten-sized tables brimming with talismans. It takes a trained eye to determine which are worth a few cents and which deservedly cost thousands of dollars. “What’s good for golf?” I asked Khun Nok, one of my regular amulet-pushers. She had never been asked that question and thought for a moment before handing me a popular rectangular amulet featuring Lord Buddha in a meditation posture. “Lord Buddha didn’t play golf,” I said. I asked what else she had. Then she showed me a fist-sized, disc-shaped jatukam amulet issued by a well-known monastery, the same amulet that Thai soldiers in the south of the country have been issued by the government for protection from Muslim insurgents. “You need protection to play golf, don’t you?” Khun Nok asked. Too many options. All made sense yet none of them felt right. “What about an amulet with Phra Reussi,” I suggested, referring to the bearded, goofy-hatted hermit monk who helps people find wisdom. “Isn’t it good to see where the ball goes?” I asked. “Well, not getting distracted is good,” I said. “Then maybe an amulet of Phra Sankachai would be helpful. Khun Nok explained that Sankachai was a ridiculously handsome disciple of Lord Buddha and was so distracted by the gazes of lust-in-their-hearts female acolytes that he turned himself into an unattractive fat monk. I patted my hard-to-control stomach, shaped in that no-man’s land somewhere between a six-pack and a keg. No, I don’t think a fat unattractive (but devoted) monk should be my personal golf role model. I was getting bewildered. I had my two-dollar jeweler’s loupe out and was examining the talismans with great intent, but little profound knowledge. I carry the loupe to pretend I know what I’m doing and to garner a touch of undeserved respect from passersby. Not much different to my on-course behavior, actually. Finally, a dozen other amulets later, she arrived at the amulet I knew she would have to arrive at. Ganesha, the elephant-headed son of Shiva and Parvati. Ganesha, the most beloved and commonly-invoked god in the Hindu pantheon. Ganesha, the cuddliest of the gods and one of the most popular in Thailand, which, although predominantly Buddhist, maintains a deep-respect for the Hindu deities. I already own several dozen Ganesha amulets, and several dozen Ganesha statues, collected from Thailand, India, Sri Lanka, Nepal and Indonesia. But a guy can’t have too many Ganeshi and I purchased (actually, the correct Thai verb to use in such a transaction is “to rent”) a cute little amulet of a dancing Ganesha. 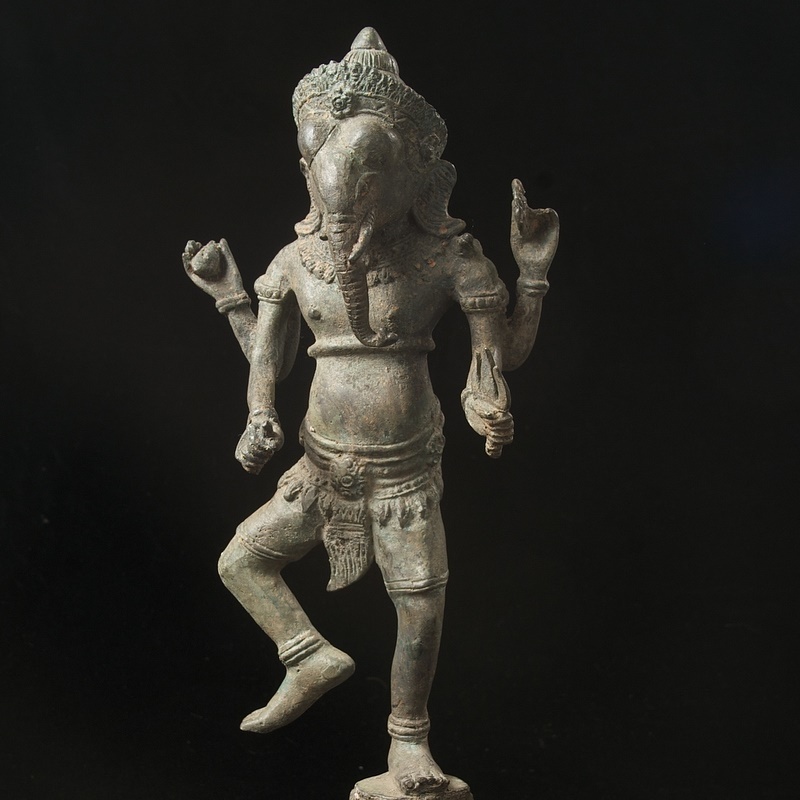 He is balanced on one leg and dancing a little jig. Sort of like he just chipped in from off the green to win the U.S. Open. As a weekend duffer I can fully understand the desire to seek the support of a benevolent outside agency. Why does one long putt go in while another circumnavigates the hole without falling? Why do some horrible slices land on a nice patch of grass with a clear opening to the green, and some wind up behind a cactus? Is this due to luck? And if so, can we improve our luck? Owls live firmly in the duality of the interface between the natural world and the human sphere. In the Hopi native American tradition, owls are associated with sorcery, and Merlin, the wizard from King Arthur’s court, kept the bird close to hand. Perhaps sorcery, an evil twin of superstition, is a good metaphor for our belief in magic and good luck spells. I find the owl’s complex duality – wise and prophetic, a messenger of death and a catalyst for insight — very Asian. The owl fits comfortably into the cosmos adapted by many Asian societies in which everything has its opposite – yang and yin, male and female, sun and moon, dry season and rainy season, fire and water, Garuda and Naga. Things can best be defined by citing their opposites. There is a light side and a dark side, and these descriptions are made without value judgments. The universe needs both. Some psychologists suggest that superstitions of any kind can raise stress and anxiety levels; for Chinese- and Japanese-Americans, the fear of the number four (the same “death” number of the locker I had been given in Singapore) – clinically described as tetraphobia – can be a real killer. Consider: on the fourth of each month cardiac deaths for Chinese-Americans and Japanese-Americans spike seven percent compared to other days, according to a 2002 study by a team of scientists at the University of California-La Jolla. I find this a pretty satisfying rationale for a practice that is not at all logical. Anything that silences the monkey-mind when I’m stroking a gotta-make-it one-meter putt is worth a try. Tiger Woods has said that Jack Nicklaus is his role model. Everyone assumes that Tiger’s adulation of the Golden Bear is due to Nicklaus’s unsurpassed string of victories. But perhaps Tiger also senses an affinity with the Bear’s superstitious nature. Nicklaus always marks his ball with the tails side of the penny up, unlike Paul Azinger who marks his ball with the penny head facing upwards, and always with Lincoln looking towards the hole. Chi Chi Rodriguez uses three different coins to mark his ball, depending if it is an eagle, birdie or par putt. On par threes, Jack Nicklaus would keep his good tee in his pocket and search for a broken tee on the tee box. Doug Sanders never played a white tee, believing them to be unlucky. As he stood on the 18th tee box of the last day of the 1970 British Open, he needed par to win the Claret Jug. The story goes that Sanders had lost his tee and a playing partner handed him a white one that Sanders decided to use, against his better judgment, to avoid slowing up proceedings. He went on to bogey the hole, famously missing a three-foot putt, and the following day lost a playoff to Jack Nicklaus (who presumably had three pennies in his pocket). Superstition is a practice that invokes a higher, or an unknowable force, to irrationally change the outcome of an action or to prevent disaster – think of how we might go out of our way to avoid walking under a ladder. But when does superstition give way to ritualized behavior which has a grounding in logic? Cohen points out that many people follow religious dietary constrictions, which at one time served a valid hygienic purpose, but which today linger because of a belief in some unprovable, unknowable theology. And then there’s Tiger’s dietary regime. Tiger Woods has a carefully worked out list of foods that he believes make him win — orange and green vegetables, fruit, turkey, baked fish, grilled chicken, skim milk, egg whites and rice. But he swears that other foods make him lose – pizza, ice cream, cheesecake, roast beef, fried chicken, and soft drinks. Is that blind ritual or just good nutrition? I’m willing to try anything. Perhaps my own golf game would improve if I carried around a lucky stone my son gave me, or an amulet I got from a wizened medicine man who doubles as a talisman-seller on the Philippines island of Siquijor. Couldn’t hurt. But practice will only get me so far. I think I’ll follow Tiger’s lead. He’s half Asian so he must know more about these things than a native New Yorker. No more pizza and cheesecake for me before a round. Superstitious? Yeah, probably. So what? The next day, following my bike ride and owl encounter, I went snorkelling on the reef just steps from the Manele Bay hotel. I met Florito “Foto” Oliva., the hotel’s beach park coordinator. We chatted about the fish that I had just seen on the coral reef – a striking dark red rudderfish, a blue parrot fish, a bright yellow tang. Somehow the conversation shifted into more esoteric subjects – the importance of the planet Jupiter in Polynesian navigation, how Polynesian circumcision parallels Jewish custom, and other esoteric relationships between the Lost Tribe of Israel, Greek mythology and Hawaiian belief systems. Recognizing that I was speaking with a wise man, I asked Foto what the pueo was trying to tell me. I was curious. Good omen? Bad omen? Or just a bird?